More Wodehouse! More (nearly) Austen! I have mentioned from time to time my obsession with P.G. Wodehouse. Obsession is possibly a bit strong; I just think that his books are such a ‘safe’ read. No one (important) dies, he has a lovely turn of phrase, and they are dependably easy to understand (as long as you can work out which oddly named character is which). There is not a great deal of variety, even if there are stand out series such as the Blandings and Jeeves, but this is part of their safe, reassuring charm. They speak of life as it probably never really existed, but filled with great characters such as the awful aunts, the daft heroes, the girls who variously urge theft, impersonation and general madness. There are (male) secretaries who throw plant pots by night, lady doctors driven mad by the frequent assumption that they cannot possibly be competent, smuggling jewels, impersonation, arson and general madness. One introduction to the nature of the beast is to be found in Plum Pie. This book contains many short stories about the famous Jeeves and Wooster and other characters such as the optimistic Ukridge and Freddie Threepwood of Donaldson’s Dog food fame. (you have to read it..) There are also very funny pieces of American news stories which reflect where Wodehouse lived much of his later life. I realise that he was a controversial character and there were issues about wartime broadcasts and presumably tax. He did create an innocent world for readers around the world and decades after; I enjoy him as the perfect relaxing read and always guaranteed to raise a smile. Today’s other book is a nearly Austen; another book written from the point of view of a character, often the male lead, featured in one of the Austen canon. Henry Tinley’s Diary by Amanda Grange is just what it sounds like, a diary account supposed to be written by Henry Tinley, hero of Northanger Abbey. These books depend on a working knowledge and affection for the original book, if only because the diary format does not permit long descriptions of place and time. It includes quotes from the original and is strong on character and the motivation and attitudes of the male’writer’. Leave a comment More Wodehouse! More (nearly) Austen! New Year’s Resolutions – and Clergy galore! My Friend Oli – who is a determined blogger of some note, among other things- pointed out the other day that it is vital to actually write your resolutions down if you are going to stand any chance of keeping them. I also agree that it’s good to take on something positive, rather than just resolve to give things up. So my resolve is to try to write more posts, which does sort of imply that I read even more books. Or maybe just finish a few more…The problem is that I rather like big books, or at least my non fiction choices are big undertakings. So, more about books in progress? I am reading a biography of Fanny Kemble,the actress, by Rebecca Jenkins, which I picked up cheaply online. An excellent read so far, with lots of 18th Century detail. More about that soon. Today’s book is a composite work, with short stories and extracts from novels. Two factors make it irresistible to me. It is by P.G. 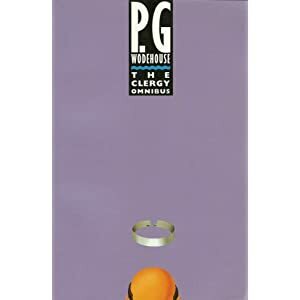 Wodehouse, who is my favourate comedy/relaxing author, and the subject is Clergy. The Clergy Omnibus is one of a series of Omnibus (Omnibusi?) produced by Hutchinson, which includes Aunts and Golf. This collection is probably for Wodehouse devotees who would recognise the origins of the pieces, or those interested in a topic and want to read Wodehouse’s best writing (about Aunts?!?). This book reveals such delights as the curate who takes elephant strength tonic with great effect, Bishops who revert to schoolboy antics, curates thwarted in love, clumsy clergy and generally bewildered clergymen. It is a funny book, and an interesting way to begin reading some of the full novels and meeting characters including the remarkable Jeeves and a highly moral cat called Webster, whose career is lovingly recorded in one of Mulliner’s tall tales. I liked this book, because it takes the same line as something like The Vicar of Dibley, in that it pokes fun at the clergy and parishioners rather than religion. The intention is just to entertain, amuse and show that the clergy of the mid twentieth century were, just like in any century, as human in their foibles as anyone else. It is dated, of course, and always unlikely, but that is the genius of Wodehouse. 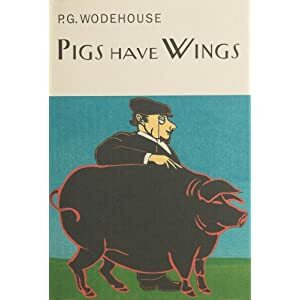 Like the book Pigs Have Wings that I mentioned a few months ago, it is safe reading for those who want to avoid death, destruction and despair in their comfort reading. It may not meet your needs, it may not be to your taste, but this is a genuinely funny book that I really enjoyed. 1 Comment New Year’s Resolutions – and Clergy galore! I’m still trying to post about books that make me happier, or at least do not fill the innocent reader with doom and gloom. I have just received, as in, I know that they are in the house, but can’t rip into the package until my birthday, the Booker shortlist. I watched The Review Programme on Friday night with Birthday Son (19 today!) and must admit that they didn’t seem that jolly. Well, I have read The Long Song and that was overall quite positive, especially given the subject matter. Will post on that after birthday. Back to my happy books. Well, an absolute superstar author in my view is PG Wodehouse. And this is my current book. It is actually one on the Blandings books, which record the daft events at Blandings Castle, home of Lord Emsworth and his pampered prizewinning pig, the Empress of Blandings. Although there are farcical misunderstandings, broken romances, attempted pig poisoning, I know that it will all end happily with even those suspicious characters only receiving their comeuppance with discomfort. Being a big fan of Jeeves and Wooster I usually watch the Fry and Laurie version when ever it appears on tv, if only because they were my (much older-ish) contemporaries Cambridge many, many years ago. Wodehouse books do not contain death, only minimal domestic destruction, and have some brilliantly funny characters. Not easy to convey in a few quotes, but worth reading the books for, even if the plot goes in for great complications. True romance always survives, and nobody ever goes seriously hungry or abandoned. Any Wodehouse book or collection of short stories will do: he produced ninety nine including a number concerning golf, which I have no knowledge or interest in, but have greatly enjoyed. When reading other book blogs, including the brilliant www. dovegreyreader.co.uk, they often ponder what makes a book readable when others seem unapproachable or just downright miserable. I do read Jane Austen, Georgette H and others, but the real mood lifters are the Wodehouse books. I’ve probably got a few left to go….